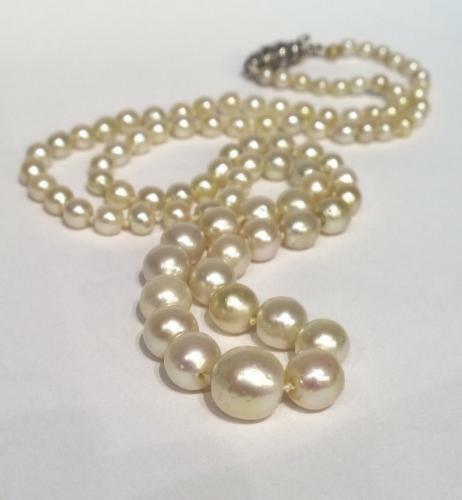 A fine quality graduated natural pearl necklace. Graduating from 3mm up to 8.5mm. In platinum barrel clasp set with 44 rose cut diamonds, integral safety catch. These pearls are really well matched and graduated with a creamy pink colour, the lustre is very good and the pearls are a good shape with minor blemishes. GCS certificate stating that the pearls are natural saltwater with no indication of treatment. All pearls have been tested, all the pearls on the necklace are natural.